The flavor combination of cranberry gelatin, apples and cinnamon makes this elegant two-layer mold the ideal holiday dessert or side dish. Stir boiling water into dry gelatin mix in medium bowl at least 2 min. until completely dissolved. Stir in cold water and cinnamon. Remove 1 cup of the gelatin; set aside at room temperature. Refrigerate remaining gelatin 1-1/2 hours or until thickened (spoon drawn through leaves definite impression). Add apples and cranberry sauce to thickened gelatin; stir gently. Spoon into 6-cup mold sprayed with cooking spray. Refrigerate 30 min. or until gelatin is set but not firm. (Gelatin should stick to finger when touched and should mound.) Place cream cheese in another medium bowl. Gradually add reserved 1 cup gelatin, beating with wire whisk until well blended. Pour over gelatin layer in mold. Refrigerate 4 hours or until firm. Unmold onto serving plate. Store leftovers in refrigerator. Substitute 2 pkg. (4-serving size each) JELL-O Cranberry Flavor Gelatin for the 8-serving size package. Prepare as directed, using JELL-O Cranberry Flavor Sugar Free Gelatin and PHILADELPHIA Neufchâtel Cheese, 1/3 Less Fat than Cream Cheese. 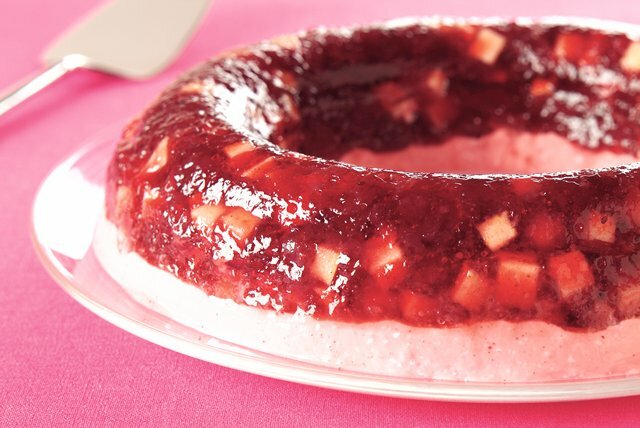 Substitute any red flavor gelatin for the cranberry gelatin. Place completely unwrapped package of cream cheese in microwaveable bowl. Microwave on HIGH 15 sec. or just until softened. Add 10 sec. for each additional package of cream cheese.